and the Colorful Seasons Stamp set. Cut tempting turquoise cardstock 8 1/2" x 5 1/2" , score @ 4 1/4"
Stamp the sentiment with tempting turquoise ink pad using the colorful season stamp set. Stamp two flowers with pumpkin pie ink pad using the Lovely Friends stamp set and then die cut images with lovely laurels flower thinlit die. 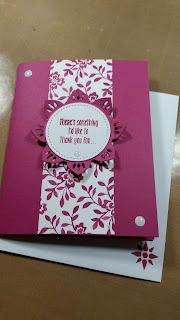 Use the fast fuse adhesive to attach the Smoky Slate die cut pieces and the sentiment layer. Use dimensionals to attached a flower too the edge of sentiment layer. To incorporate the Soft Sky color I added subtle enamel shapes. 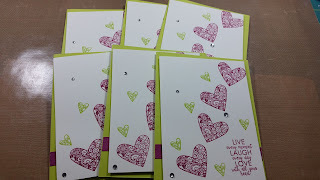 To give the card that extra pop, I also added Pumpkin Pie enamels shapes. Join the fun to make this paper treasure! This month our team is having our very first card swap. The swaps had to be created from new products in 2017-2018 catalog. Raquelle C with The Lady and her Stamps. but created one for my video. Cut lemon lime twist cardstock 8 1/2" x 5 1/2", score 4 1/4"
Cut very vanilla cardstock 4" x 5"
Cut berry burst ribbon 4" x 5 1/2"
Using the large and small heart stamp the very vanilla cardstock with both ink pads to create your desired image. 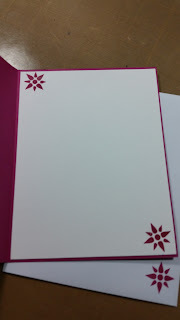 Use the berry burst ink pad and stamp your desired sentiment. Use the fast fuse adhesive to attach the ribbon to the card base. Use (4) dimensionals to attach the very vanilla layer to the card base. Remember to turn very vanilla layer slightly diagonal and then attach. 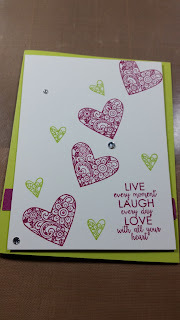 Add rhinestones to card for that extra pizzazz! You can never have too many Thank you cards. 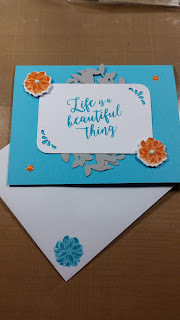 I created this card using the Fresh Floral Designer Series Paper and the Eastern Beauty Bundle. The sentiment came from one of my Paper Pumpkin kits. I really love the new 2017-2018 in-colors. Cut berry burst cardstock 8 1/2" x 5 1/2", score 4 1/4"
Use the eastern medallion die to cut the berry burst cardstock. Use the stitched circle shaped thinlet die to cut the whisper white cardstock. inside layer and matching envelope. Use snail adhesive to attach the dsp and inside layer to the card base. Use dimensionals to attach square shaped sentiment embellishment to top of card. Add perfect pearl accents to card for that extra pop.